Camper Size Bed Dimensions are generally Camper Twin 34 inches wide by 74 inches, Camper Full or Camper Double 49 inches wide by 74 inches long, Camper Full XL 53 inches wide by 79 inches long and Camper Queen 60 inches wide by 74 inches long. These are fairly standard Camper bed measurements. 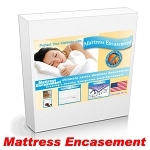 Camper Mattress depths can vary from just a few inches to 10 inches or more, depending upon the manufacturer. 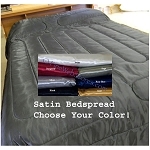 Many times, actual camper mattress dimensions will vary by one or two inches, usually smaller.